This room came together because of so many folks coming over and making it happen for us and Nana. The back story is that we were remodeling the guest bathroom, then found out Nana had to move inand added the entire guest suite remodel, then had to get it all done in two-weeks. We won’t ever really be able to explain to Nana that my mother watched the kids till she couldn’t think anymore, and then Mitch’s mother dropped everything to give my mother a break. We won’t be able to have her understand my little sorority sister came and cooked the whole family a pot roast with her child in tow two days before Nana moved in (and brought wine!) and that SAVED my sanity.She won’t remember her other grandson bringing a cable wire kit to the house just too make sure she had her tv shows the second she sat down. But we will. We will always cherish that these people and so many more helped us make this happen. 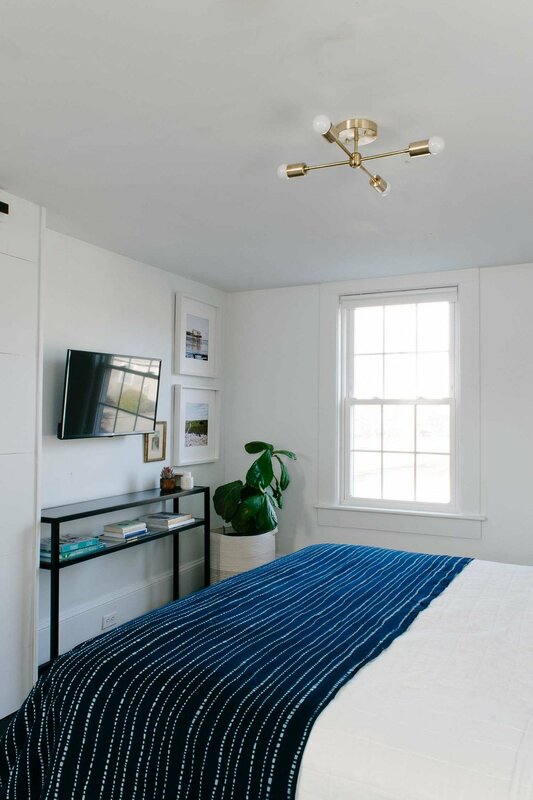 This guest room reveal is bright and airy with lots of history mixed into the room. I’ll link all sources at the bottom! And the rich history that has gone into this room is remarkable. With the addition of Nana we now have four generations under one roof. I used items to stage the area from my father, my mother, Nana’s collections, thrifted antique art, and photos I took myself. So many stories go into all the items. 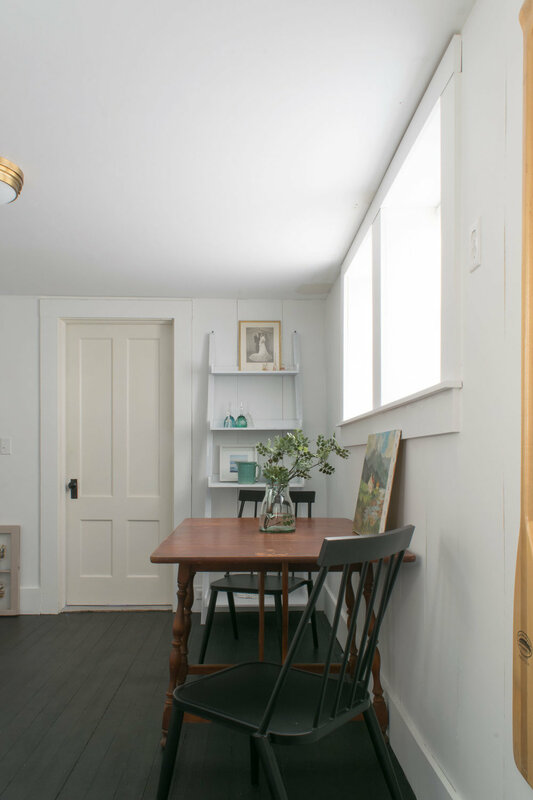 Pretty much everything was painted, including the beat up floors, which we ultimately decided would go black (SW Tricorn) with Sherwin Williams porch paint. We revealed our collaboration with Holly and Martin a few weeks ago. 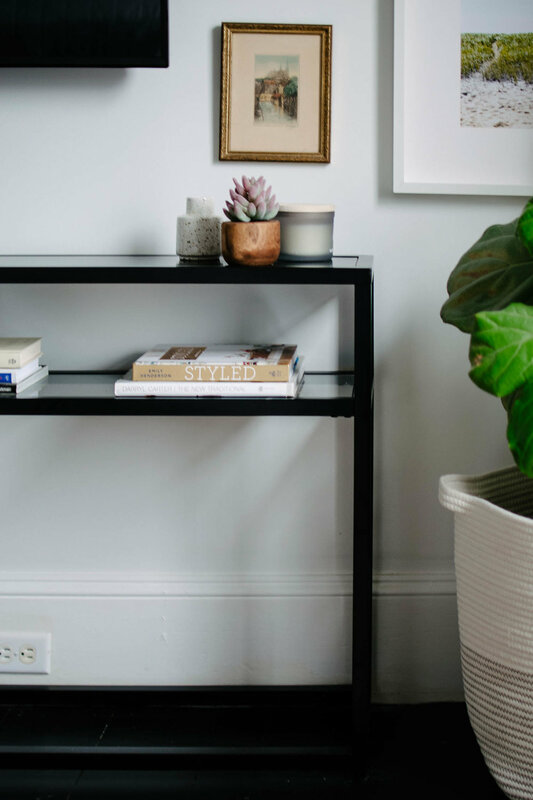 Turning a console table into our guest suite TV stand. And... they have decided to give one away to one of our readers!!! Details at the end of this post! 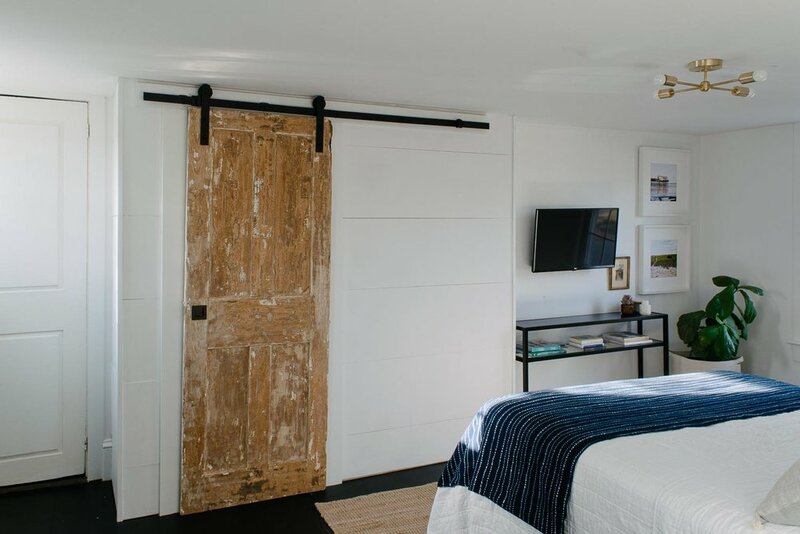 It ended being the perfect multi-purpose piece for the room, narrow enough for a good walkway around the bed, and it visually stands out all while not being too bulky in the room. Originally the room didn't have a door, and over the last 50 years it was used as a kids room and probably a play area given the multi-colored paint we found under the wallpaper. But we needed this room to FUNCTION, especially once we found out Nana was moving in. The middle stairs we mostly use to get to our bedrooms is right on the other side of the wall here. So, a very budget friendly doorway was created (we haven't even finished the hall side of it yet). The door is original to the home. 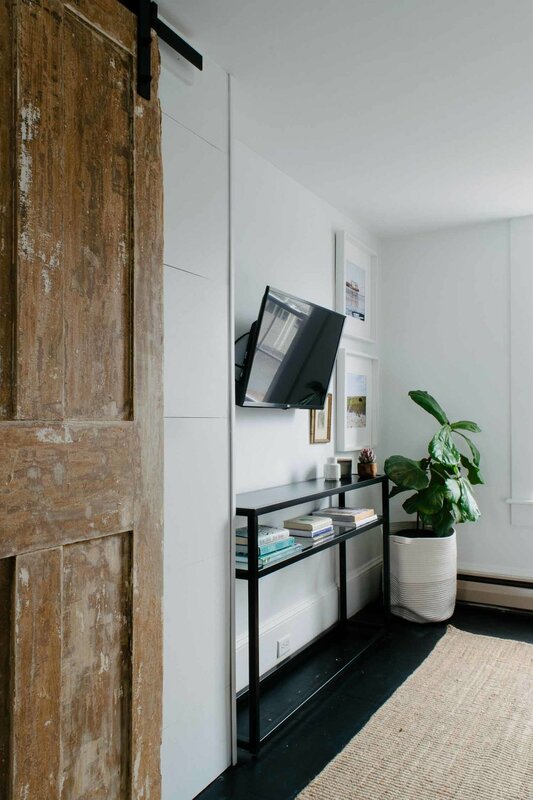 I stripped it down in an effort to start anew without 170 years of paint, but fell in love with the raw beauty it provide to an otherwise black and white room. 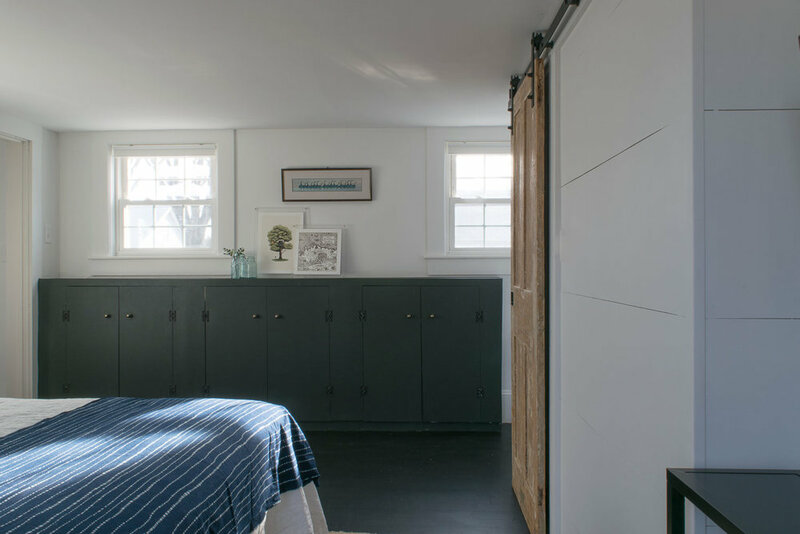 Without such a time crunch we probably would have DIYed a light fixture for this room. We've partaken in building two for our bungalows entryway, and a sputnik chandler for the dining room, in the past. 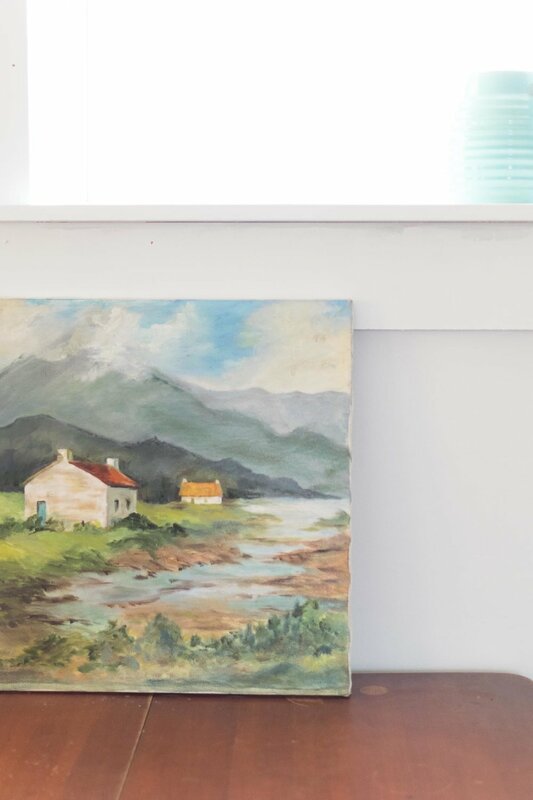 Instead I found this beauty from a shop on Etsy, the price was right and the mix of mid-century with our Historic home is just the look I like to create. Voila, we had a light for the space. The bed frame was a free item I got from a local Facebook group Buy Nothing, which Ashley at the The Gold Hivetold me all about earlier in 2018. We sanded all the areas down to raw wood, coating with a white stain. Any area I couldn't quickly sand I decided to paint white. Giving a color block look. In lieu of a side table (since Nana sleeps on the other side) I put her chest. 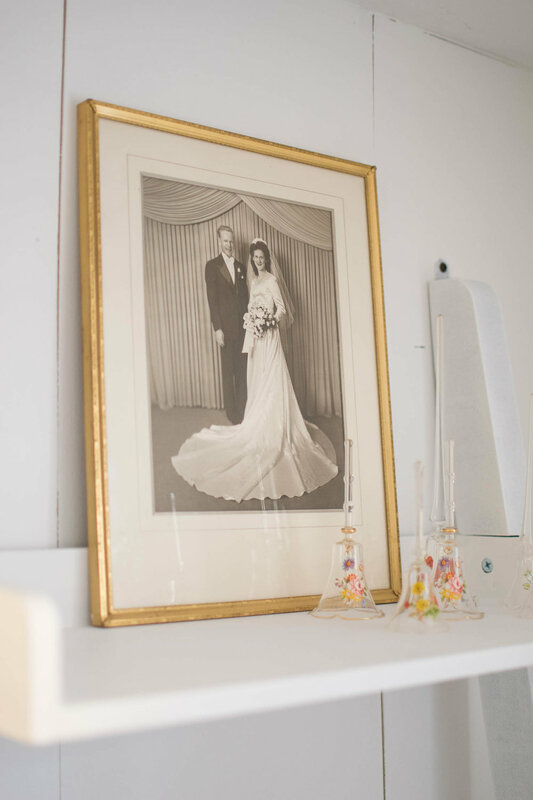 Which still holds her wedding dress and cake topper amount various other lifetime trinkets. I should note that all the art and most of the other decor was either from my collection or borrowed from my mother's for this room. We had a really tight budget to work with once we found out Nana was moving in and we needed to makeover the entire guest suite. 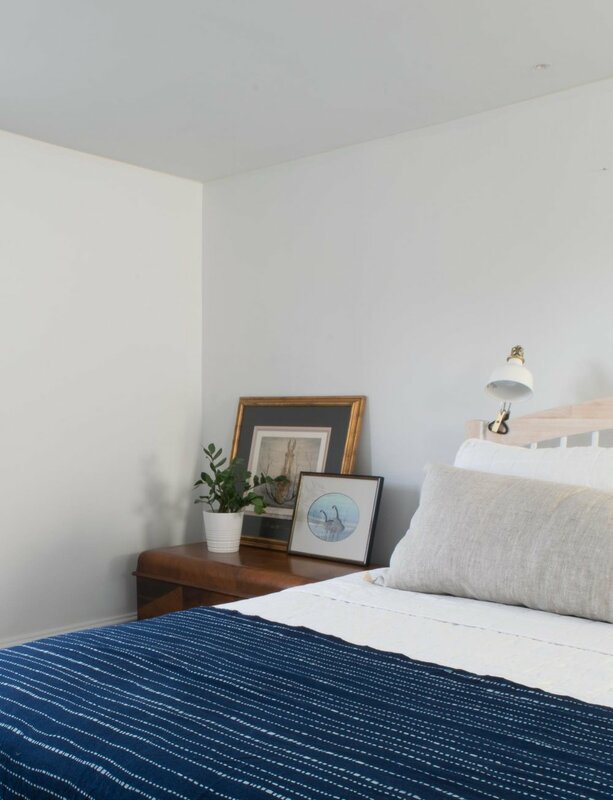 I honestly couldn't be happier with the way the room turned out, its so refreshing to use items you already own and STILL create a unique space. One splurge was this Juniper Studio lumbar pillow. I originally decided on it when the space was supposed to be an Airbnb. 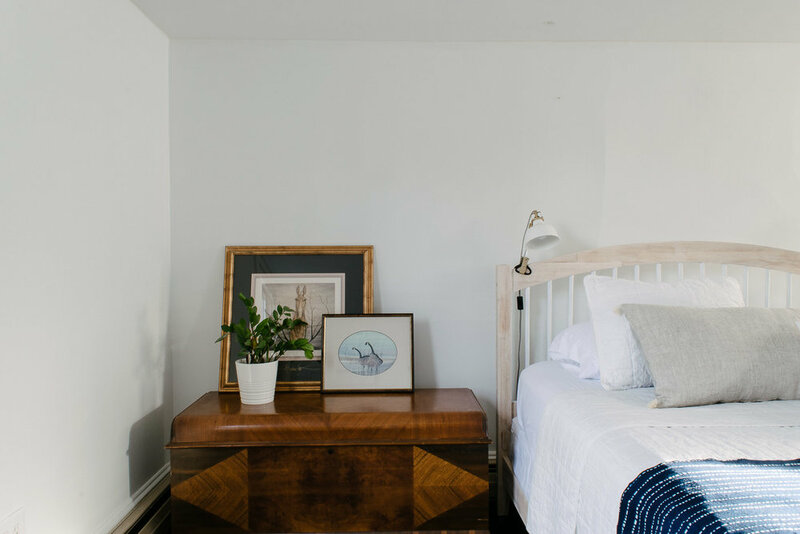 It's a simple solution for dressing up a bed, all while keeping the process of making the bed simple. Then there is the bank of cabinetry, something that is a bit odd with its placement on the wall and un-centered under the windows. It's neither original to the home or needed in terms of storage, but I knew we wouldn't be creating more storage in its place anytime soon so it has stayed. It wasn't until we decided we would eventually make the space into and Airbnb that we saw its potential as a suite. So we just kept that suite set-up when we found out Nana was moving in. A bedroom, common room for eating and working, and full bathroom is a perfect suite set up for renting out the space! 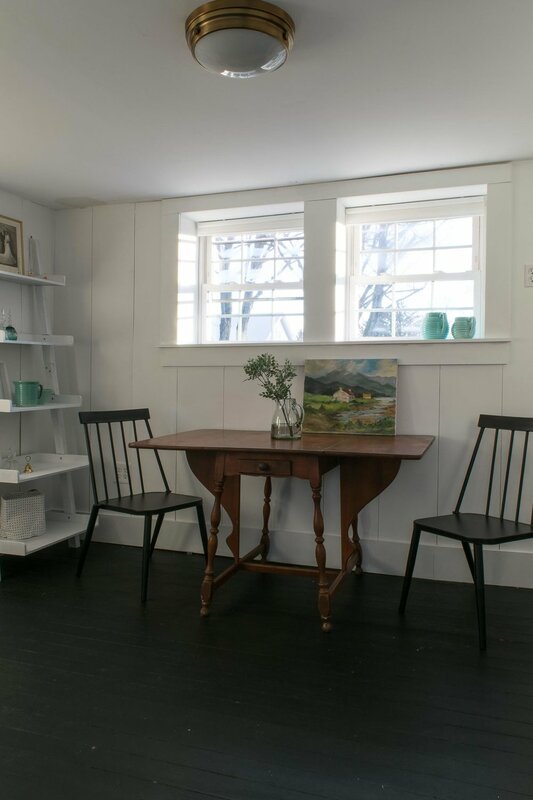 The common room was the only one in the space that had some of the original beadboard (this space is an addition added sometime after the original 1847 structure). But we didn't have the time or funds to match the original headboard so we decided to panel over it. One day we will likely remove the temporary paneling and refurbish the original headboard but for now we needed a nice space for Nana to use. Originally we had a plumbing chase that ran in-between the windows and up the wall. You can see the box like structure "sitting" on the desk top in the before photo above. 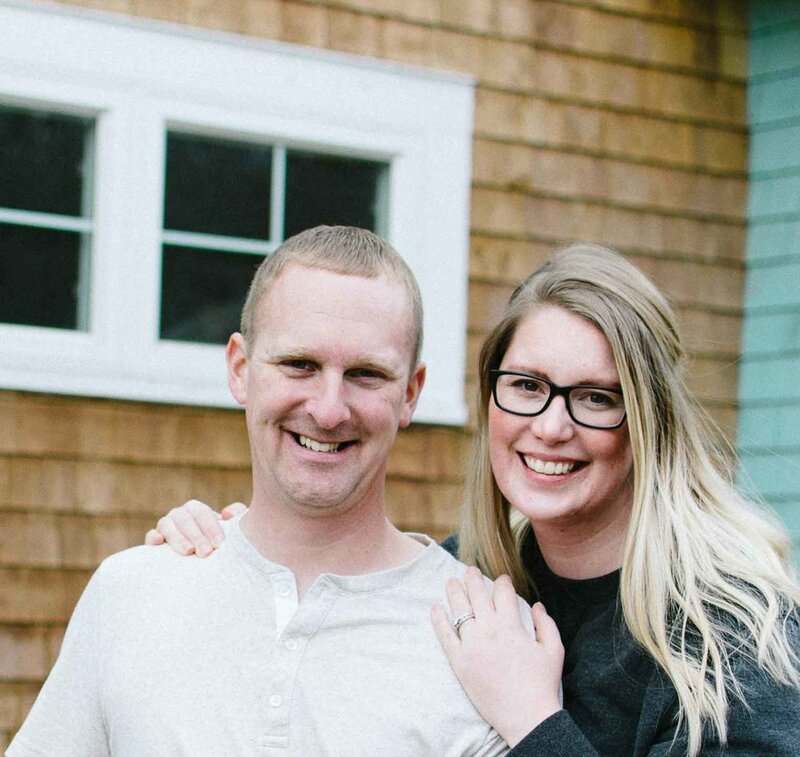 Old homes almost always have weird plumbing situations, but certainly if renovations and additions were added haphazardly due to time or money constraints. I'm sure throughout the 172 years of this homes life its seen its fair share of time or money constraints. Heck this reveal had both those factors in it from the very beginning! We debated on painting the pipes but one night it just popped into my head to make the wall deeper and have big glorious window sills. It was something we could do ourselves and the cost was minimal to boot! Purely aesthetic's but what a difference that change made! Holly & Martin has decided to give one of our readers this amazing console table! AND..... use code GIANT30 in order to get 30% off anything at Holly & Martin! Head over to our Instagramfor details and to enter for a chance! Since writing this post Nana has moved into a rehab facility for the foreseeable future. She is doing fair health-wise and continues to miss "her comfy bed at home". Which makes us feel better about her living with us for such a short period of time. We are so very thankful for all who helped us get her into this space so we could take care of her for a bit. 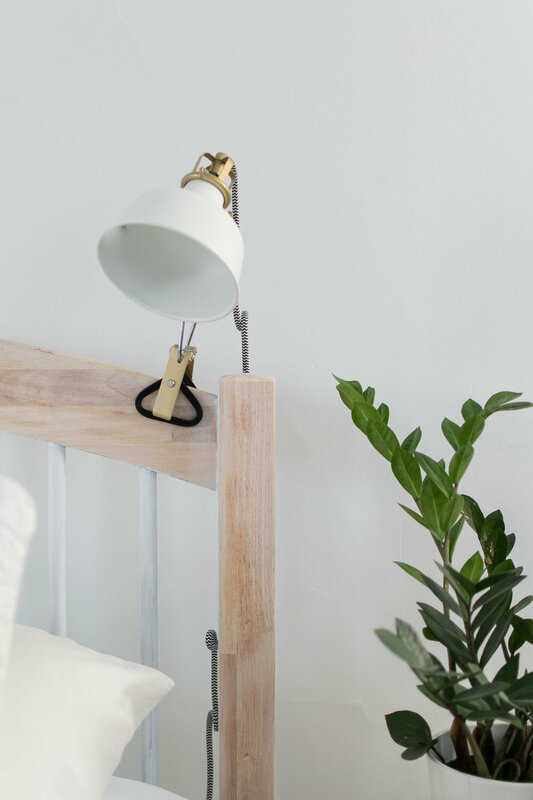 Sometimes we have to find space saving solutions for our rooms, whether we live in a small or large home. 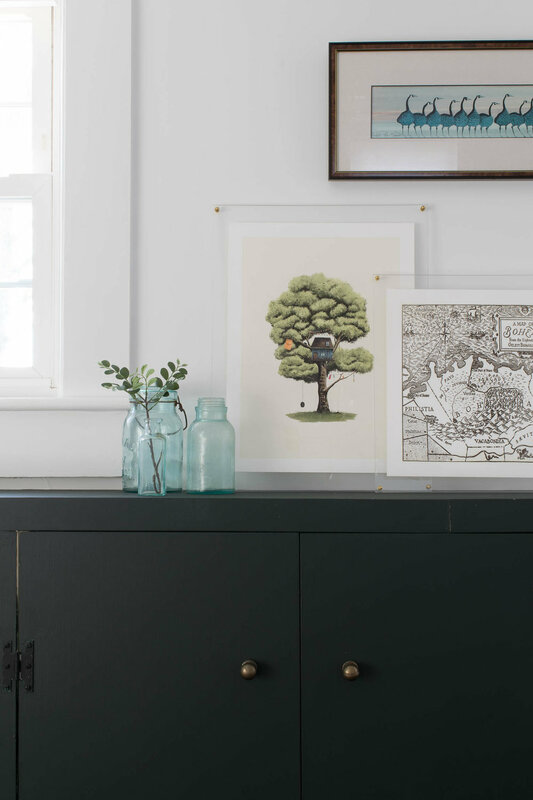 This multi-use space saving TV stand from Holly and Martin is actually a console table, and we couldn't be more pleased with how perfect the space turned out!